Sometimes when Murphy’s Law gets the best of you, good things can come out of a situation. This pizza idea is one of them. My brother was home from Colorado, “home” being my mother’s house almost three hours from mine, so I invited him to join us for a local concert that my son and I were attending. As it turned out, he wasn’t able to borrow my mom’s jeep to meet us there because her husband’s truck was in bad need of repair leaving them with only the jeep. I volunteered to pick him up and take him to my house after the concert, then drive him back the next day. Long story short, all of this traveling and a miscalculation on my part as to the amount of time that was required to get from Mom’s to the concert venue left us no time to stop for dinner as I’d planned to do. Fortunately, Murphy didn’t curse us with a flat tire or a fender bender only growling stomachs. My son and I thought we remembered that The Orange Peel, the club where the concert was to be held, served slices of pizza from one of those lit pizza cases. If there was no time for anything else before we reached Asheville, whatever they provided would have to suffice. We were there for music, after all, and no one really cared what we ate that night. 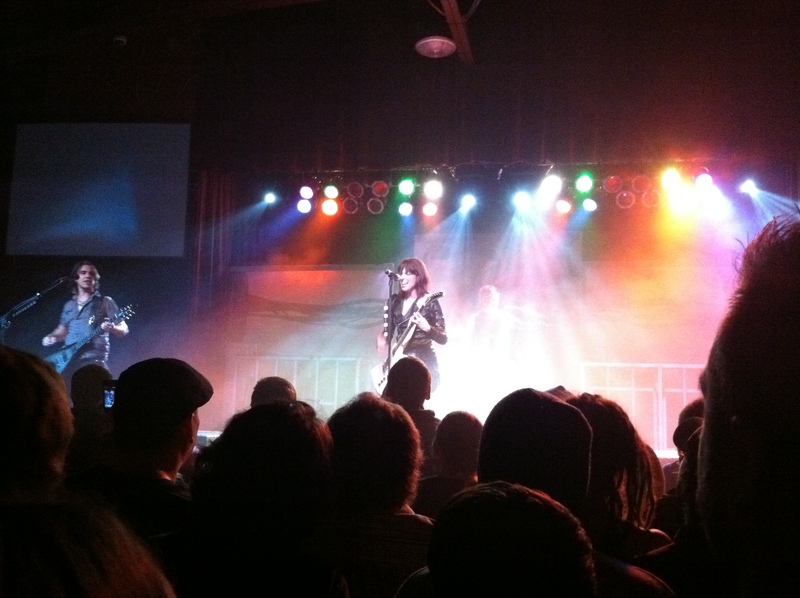 Halestorm. I'm not too fond of female rockers, but this chick had the biggest voice I've ever heard and played the guitar better than most men I've seen. So though we were very late, thanks to my fretful nature only late to getting a spot at the front of the line waiting for the doors to open in an attempt to be front row of the standing room only event, but still an hour early for the concert, we did find, right in the entryway, a pizza stand. There were three choices of pizza and two choices of beverage. Cheese, Pepperoni, or Greek pizza and beer or Red Bull. I knew other beverages were available inside the concert hall, so all three of us chose the Greek pizza which looked surprisingly fresh and much tastier than any other Greek pizza I had sampled. Huddled inside, having given up on finding a spot within spittle and perspiration flying distance of the performers, we ate our pizza standing in a circle near the back, exclaiming our oos and mms concerning an unexpectedly delicious slice of pizza which was the size of two regular slices. 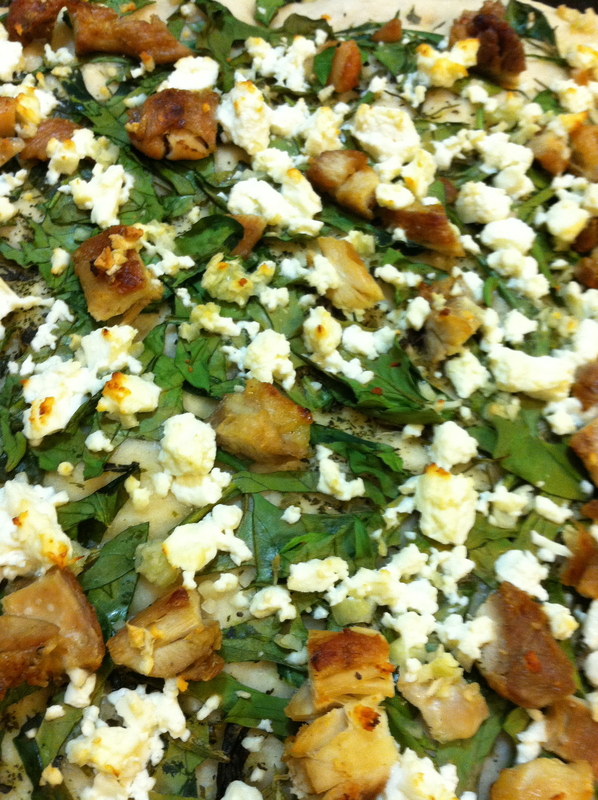 It had a crispy, thin crust, lots of fresh spinach and garlic, almost raw in fact, with feta cheese on top. I couldn’t remember later if there was chicken on the pizza, it seemed like there had been. We didn’t think any more of it that night, but days after the concert I started thinking about that pizza when I was planning my menu for the week following New Year’s. I decided to duplicate it, as I intended to get my family back on track after an extremely splurgetory (Yes, I know that’s not a word. It is now.) holiday season. I bought all of the ingredients I thought I would need, including chicken breast, and a few afternoons later I set to work. I purposely did not allow the dough to rise, as I was aiming to achieve the flat and crunchy crust of The Orange Peel’s pizza. My finished pizza was not quite the same, in fact it left me craving the original, but we did all very much enjoy my copycat version. I was told that the pizza at The Orange Peel is provided by Asheville Pizza & Brewing Co. So pizza and locally made beer is on the To Do List for sure! They also play movies!! Sounds like an evening of too much fun, to me. Prepare topping ingredients. Heat oven to 400 degrees. To make the crust, sprinkle the yeast into the warm water. Allow to dissolve for 5 minutes or so. Sift together 4 c. flour and the salt in a large mixing bowl. Add the yeast mixture to the flour mixture. Stir well to combine. 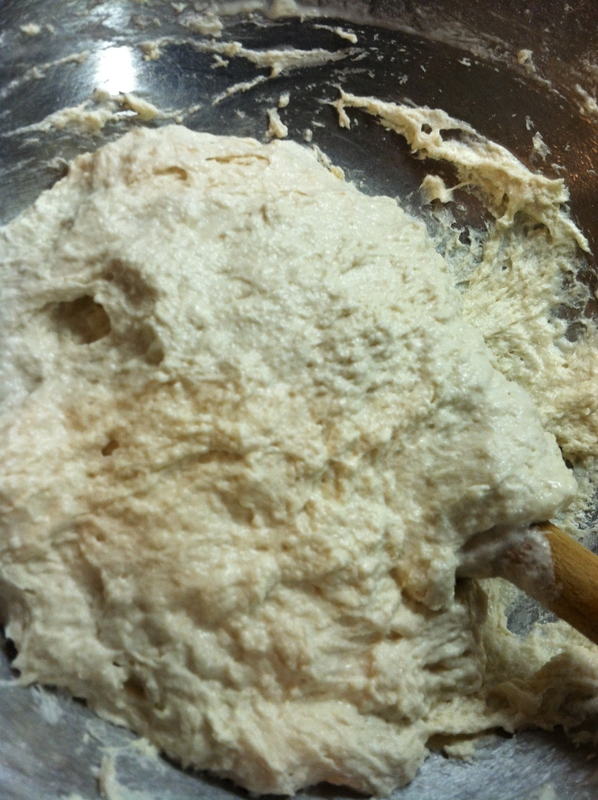 Work in an additional cup of flour and stir until the dough leaves the sides of the bowl. 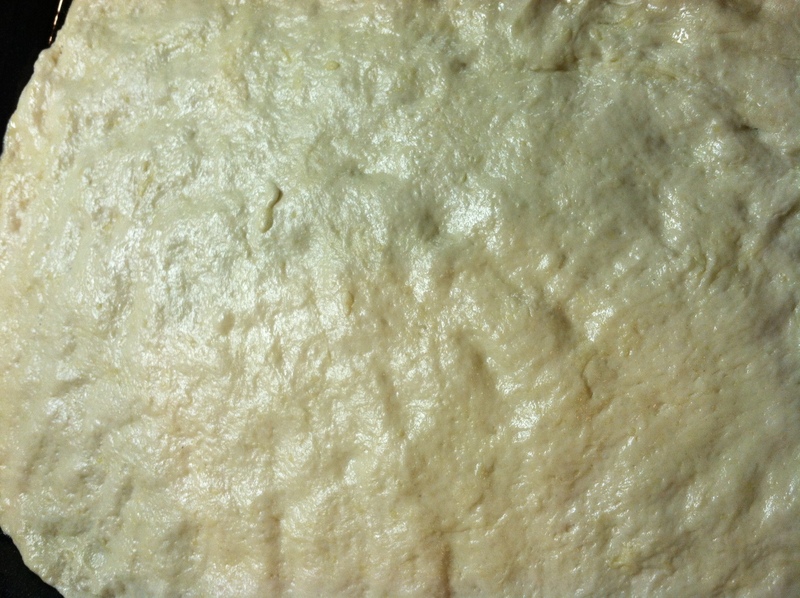 Turn onto a floured surface and knead with well-floured hands until smooth and elastic. Oil two sheet pans roll dough into a rectangle and transfer to sheet pans, pressing in to fill corners and edges or work it in without rolling. Brush on olive oil to coat. Sprinkle on herbs. 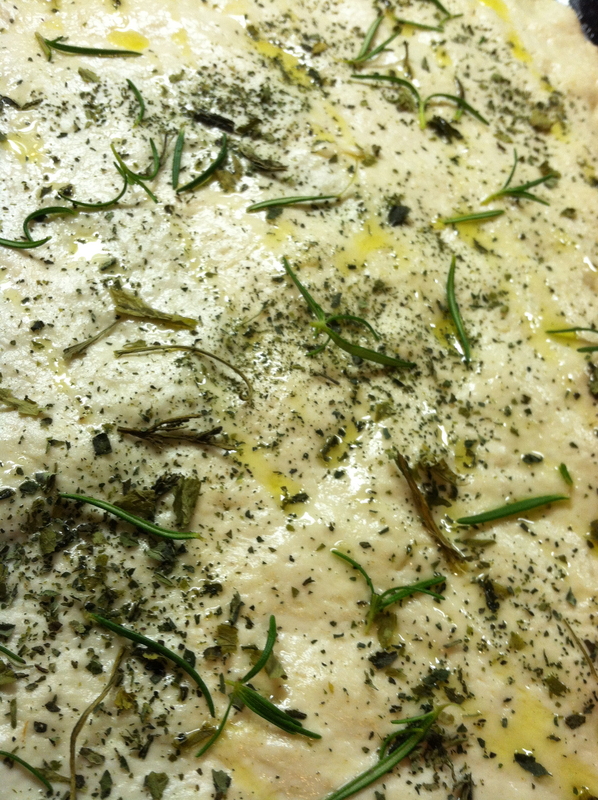 I used fresh rosemary and basil and oregano that had been dried from my garden. Fresh would be best, of course. Sprinkle on the spinach. Distribute the chicken pieces on top. 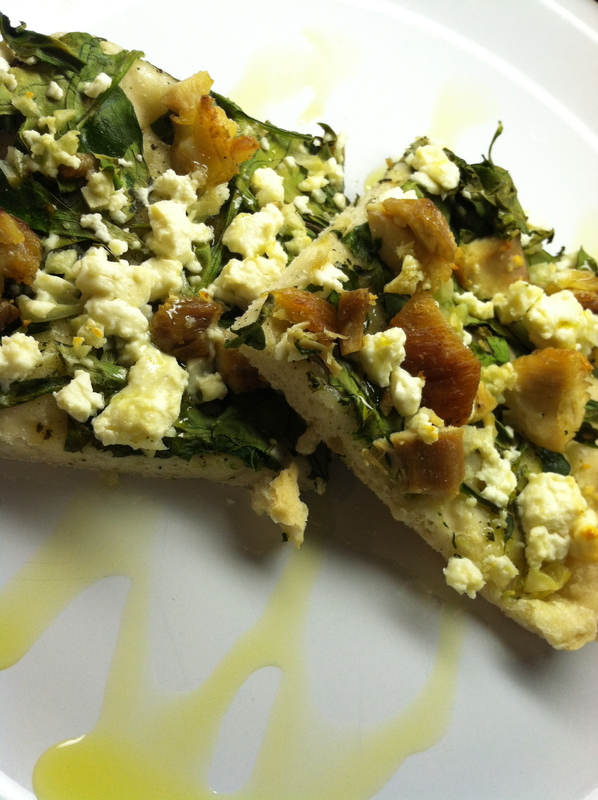 Dot with feta and garlic. I used a lot of garlic. 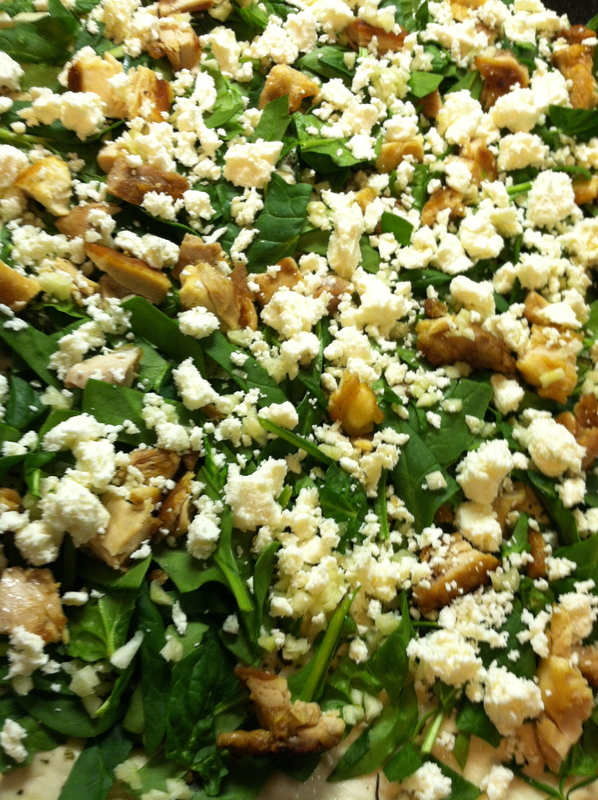 It would have been more luxurious with tons of mozzarella piled under the spinach but not as good for us. It also would have ruined the fresh, light taste I was going for. Mine didn’t end up as fresh in taste or appearance as AP&BCos. I had to cook it past that point to allow the crust to bake. I think next time I will cook the crust fully or partially, then add the toppings so they have that fresh, raw taste. Either way, this will be a permanent menu item for this family made with a whole wheat crust. Make it vegetarian by omitting the chicken. « My baby’s one year old.